Wall Street isn’t the only powerful American institution that has betrayed the rest of the country. As our financial institutions were jettisoning integrity and responsibility, so was the Democratic Party. What has happened over the past three and a half decades is that the Democratic Party has increasingly turned its back on its own great achievements - that created the most progressive era in American history, bordered by the New Deal and the Great Society. In a preview of what was to follow, Carter signed a bill bailing out the Chrysler Corporation even as he was canceling military pay raises despite high inflation. |||| Official Washington is not alone in its odd indifference to the nature of the S&L solution. The media --even the op-ed pages and Sunday feature sections -- have largely ignored the question. . . Cost estimates continue to soar - as high as $500 billion if you believe congressional analysts or $1.4 . . . Put rather neatly by one former FBI fraud specialist to the Village Voice, the S&L crisis is perhaps the largest criminal conspiracy ever created. The FBI currently has some 8000 cases of S&L fraud before it, 1300 of them gathering dust for lack of funds to pursue them. Another 13,000 tips haven't even been followed up, according the Newsweek. . . Among the other clear beneficiaries of the bailout are the quick-rich financiers who, with their soul brothers, helped to create the scandal. Small business and ordinary citizens are not invited to the RTC's extraordinary fire sales. You can't get a catalog and order by mail. . .
We know - or should know by now - that the crisis was created in no small part by the gluttony and stupidity of advocates of the so-called free market running rampant through America's fiscal countryside. . . As Rep. Charles Schumer put it, "The government behaved like a fire insurance company that said to its customers, go ahead, play with matches. We'll cover you if anything goes wrong." Although some Democrats are smugly blaming the Republicans for the S&L disaster, the truth is that this bill passed the House 380 to 13 and by a voice vote in the Senate.”. . .
Like the present crisis, the Democrats were deeply part of the problem. And not just politically. For example, Bill Clinton’s business partner and buddy, Jim McDougal, owned Madison Savings & Loan. In 1983, state regulators warn the S&L to stop making imprudent loans. Governor Clinton was also warned of the problem but took no action. In1986, a Federal Home Loan Bank Board audit described Madison as financially reckless, rife with conflicts and on the brink of collapse. It said that the S&L's records are so poor that examiners often could not discover the "real nature" of transactions. In August federal regulators removed McDougal from the board of Madison. In 1989 Madison S&L was closed by federal regulators at an eventual cost to taxpayers of $47 million. Jim McDougal was indicted for bank fraud. McDougal wasn’t the only Clinton pal to be involved in financial shenanigans. In I976, two Indonesian billionaires had come to Arkansas. One of them, Mochtar Riady, was looking for an American bank to buy. Riady met up with another Clinton friend, Jackson Stephens, with whom he forms Stephens Finance. Later Stephens will broker the arrival of BCCI to this country and steer BCCI's founder, Hassan Abedi, to Bert Lance,who had been Jimmy Carter’s budget director until he became embroiled in a financial scandal. And then there was Clark Clifford who had been a close adviser to Truman, Kennedy, Johnson, and Carter who would be indicted in the BCCI scandal, with the indictment later dropped because his failing health. BCCI at the time was the seventh largest private bank in the world and operated in 78 countries in ways that were never fully determined. There were even early warnings of offshore money laundering. An independent investigator would find evidence of an electronic transfer of $50 million from the Clinton-created Arkansas Development Financial Authority to a bank in the Cayman Islands. Grand Cayman has a population of 18,000, 570 commercial banks, one bank regulator and a bank secrecy law. It was a favorite destination spot for laundered drug money. There have been charges that the ADFA worked with BCCI to launder major drug funds. “Clinton has barely mentioned civil liberties. They do not seem to be of much concern. The president has, in fact, engaged in the worst kind of politics, namely the kind that trades human life and suffering (e.g. capital punishment and mandatory sentences) for popular support. He appears willing to ignore the great residue of Reagan-Bush offenses, especially those growing out of the war on drugs and attempts to gag and intimidate government and defense workers. And he seems similarly disinterested in unclosed cases of political racketeering such as those involving BCCI and BNL. Said one activist lawyer who has met with Attorney General Reno: ‘She's closing her ears to all of that.’"
Once in office, Clinton committed perhaps his greatest contribution to the current crisis: repealing the Glass-Stiegel Act. Then, after Bush Jr, came Barack Obama, who grossly misled a major portion of his constituency to become the most conservative Democratic president since Grover Cleveland. - Democrats held the White House for over forty percent of the time during which the county has collapsed into its present dismal state. They did so – including their liberal wing – without seriously challenging any of the Reaganesque economic and political mythology. - In doing so, they were actually far more effective than the Republicans at destroying their own political heritage. - Accepting conservative economics - They lost interest in economic politics that benefited the mass of the public. This may have been a result of a leadership become part of the economic elite and having been bought out by major contributors, but in the past 35 years, liberals have not even seriously attempted one major economic reform that could have attracted middle class voters away from the GOP fraud. Compare this record with that with New Deal programs such as the Civilian Conservation Corps, Public Works Administration, Social Security, federal insurance for bank accounts, welfare, unemployment insurance, child labor laws, bargaining rights for labor, restrictions on overtime, a 40 hour work week and a minimum wage. By comparison, in real dollars the minimum wage peaked in 1960s, and is now down by almost a quarter. And when was the last time there was an active liberal effort to raise the minimum wage? As for the official work week, it’s still where the New Deal put it. - Not distinguishing between bad corporatism and good business - In fact, most free workers in this country were self- employed well into the 19th century. They were thus economic as well as political citizens. These corporations, says Huston, "killed the republican theory of the distribution of wealth and probably ended whatever was left of the political theory of republicanism as well. . . .[The] corporation brought about a new form of dependency. Instead of industry, frugality, and initiatives producing fruits, underlings in the corporate hierarchy had to be aware of style, manners, office politics, and choice of patrons -- very reminiscent of the Old Whig corruption in England at the time of the revolution -- what is today called 'corporate culture.'" Concludes Huston: "The rise of Big Business generated the most important transformation of American life that North America has ever experienced." Today, neither party speaks for, nor represents, the smaller commercial enterprises that provide the jobs, innovation, and community support that a well working commercial society possesses. And it has never even seemed to cross the liberal mind to do so. - Not conducting government at the lowest practical level. It is one of the easiest ways to connect people to worthy government enterprises and it is the form of government most popular with the people by a long shot. Yet liberals and other Democrats have repeatedly treated the concept with contempt, regularly tying any suggestions of localism to the state rights arguments of segregationists. Liberals are afraid to criticize big government because they think it makes them sound like Republicans. In fact, the idea of devolution -- having government carried out at the lowest practical level -- dates back at least to that good Democrat, Thomas Jefferson. And conservative columnist William Safire admitted that "in a general sense, devolution is a synonym for 'power sharing,' a movement that grew popular in the sixties and seventies as charges of 'bureaucracy' were often leveled at centralized authority." The modern liberals' embrace of centralized authority makes them vulnerable to the charge that their politics is one of intentions rather than results -- symbolized by huge agencies like the Department of Housing & Urban Development that fail miserably to produce policies worthy of their name. The question must be repeatedly asked of new and present policies: how can these programs be brought closer to the supposed beneficiaries, the citizens? And how can government money go where it's supposed to go? Because such questions are not asked often enough, we find huge disparities in the effectiveness of federal programs. For example, Social Security functions well with little overhead. In such programs, the government serves primarily as a redistribution center for tax revenues. On the other hand, an environmentalist who ran a weatherization program told me once that she figured it cost $30,000 in federal and local overhead for each $1600 in weather-proofing provided a low income home. Similarly, a study of Milwaukee County in 1988 found government agencies spending more than $1 billion annually on fighting poverty. If this money had been given in cash to the poor, it would have meant more than $33,000 for each low income family -- well above the poverty level. The newsletter Neighborhood Works quoted Art Lyons, director of the Center for Economic Policy Analysis, on what goes wrong: "Salaries of social service professionals are spent back in wealthy communities. The building rent goes to the landlord, who probably doesn't live in the neighborhood. So the system creates a self-contained prophesy of poverty and deprivation." Sometimes all it takes is a little common sense. The photo below shows a construction sign from the federal highway program of the 1950s. 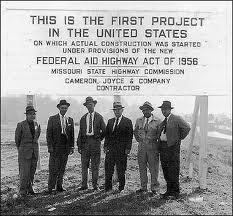 Note that not only is the Missouri State Highway Commission, as well as the contractor, given credit, the stars of the project are honored as well. Today I live five miles from a small Maine town. Each trip requires me to ride over a strip of incomplete major improvements in the two lane road indubitably funded in no small part by Obama’s stimulus plan. But there is not one sign giving anybody credit. So residents can cruise over the road and not have the faintest idea that they are beneficiaries of that stimulus gobblygook the president talks about. Just one small example why bringing things to the lowest practical level makes a lot of sense. Today's occupiers have demonstrated the enormous power of local action. It shouldn’t really surprise us. After all, how often does meaningful change come from the top down, at least until those at the top have been educated by those at the bottom? It is not, however, just Wall Street they need to challenge, but the politics that Wall Street has helped so mightily to create. A politics that doesn’t understand the nature of decent commercialism, the need to make life better for the people who vote for you, and the need to keep politics close to home. The politics that the Democratic Party deserted several decades ago. It’s time to occupy the Democratic liberal philosophy and replace it with some true progressive populism. It’s worked before. That’s why we have a 40 hour work week, a minimum wage, and Social Security just to name a few. Maybe it can work again.